EMBARGOED TO 0001 SUNDAY MARCH 17 EDITORIAL USE ONLY Selfridges Birmingham, at the Bullring is lit green by Tourism Ireland to celebrate St Patrick's Day. EMBARGOED TO 0001 SUNDAY MARCH 17 EDITORIAL USE ONLY The Eden Project in Cornwall is lit green by Tourism Ireland to celebrate St Patrick's Day. EMBARGOED TO 0001 SUNDAY MARCH 17 EDITORIAL USE ONLY St Michael's Mount in Cornwall is lit green by Tourism Ireland to celebrate St Patrick's Day. EMBARGOED TO 0001 SUNDAY MARCH 17 EDITORIAL USE ONLY Coca-Cola London Eye in Westminster is lit green by Tourism Ireland to celebrate St Patrick's Day. EMBARGOED TO 0001 SUNDAY MARCH 17 EDITORIAL USE ONLY Riverside Museum in Glasgow is lit green by Tourism Ireland to celebrate St Patrick's Day. EMBARGOED TO 0001 SUNDAY MARCH 17 EDITORIAL USE ONLY The National Space Centre in Leicester is lit green by Tourism Ireland to celebrate St Patrick's Day. EMBARGOED TO 0001 SUNDAY MARCH 17 EDITORIAL USE ONLY Nelson's Column in Trafalgar Square London is lit green by Tourism Ireland to celebrate St Patrick's Day. EMBARGOED TO 0001 SUNDAY MARCH 17 EDITORIAL USE ONLY The British Airways i360 observation tower in Brighton is lit green by Tourism Ireland to celebrate St Patrick's Day. 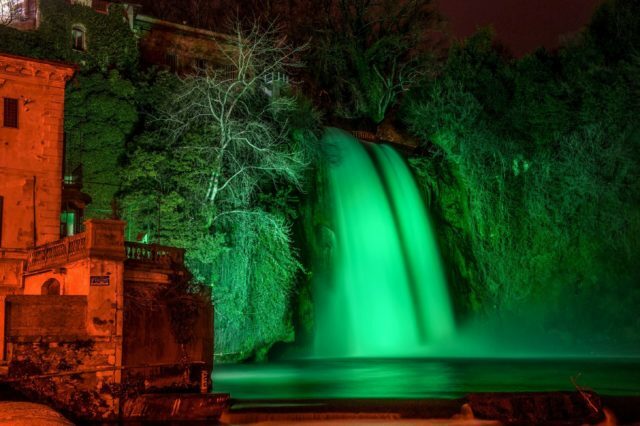 Hundreds of iconic buildings across the world are going green to celebrate St Patrick's Day. World famous sites such as the Great Wall of China, the Leaning Tower of Pisa and the Sydney Opera House are among those taking part in Tourism Ireland's Global Greening campaign. The aim of the initiative, which is in its 10th year, is to encourage people to visit Ireland. It celebrates the island of Ireland and St Patrick's Day. Tourism Ireland chief executive Niall Gibbons said: "This is the tenth year of Tourism Ireland's Global Greening initiative and it's bigger and better than ever this year, with some wonderful new additions like the Burj Khalifa – the tallest building in the world." In addition to the Burj Khalifa, Victoria Falls in Zimbabwe, York's medieval city walls and Lord's Cricket Pavilion in London will also turn a shade of green for the first time this year, as will the Shizuoka Stadium ECOPA stadium in Japan where Ireland will play Japan in the Rugby World Cup in September. Mr Gibbons said: "St Patrick's Day traditionally marks the real start of the tourism season for us; our aim is to bring a smile to the faces of people around the world and to convey the message that the island of Ireland offers the warmest of welcomes and great fun, as well as wonderful scenery and heritage. "Our St Patrick's programme spans Great Britain, mainland Europe, North America, Australia and emerging tourism markets like China, Brazil and the Middle East. "We are using every opportunity to capitalise on the island of Ireland's heightened profile this weekend; the saturation coverage about Ireland across the global airwaves, in newspapers and digital media, is an invaluable boost for our overall 2019 tourism promotional drive." A statue called 'Mac the Moose' in the city of Moose Jaw in Canada, a leopard statue in Kenya and a green bicycle parade through Amsterdam are some of the more unusual additions this year. They join the London Eye, the Empire State Building in New York, Chicago's John Hancock Center, Disneyland Paris, the Colosseum and the Las Vegas 'Welcome' sign, which have been turning green for a number of years to mark the March 17 celebrations.